The first you need to know how to create a MySQL database? When you to set up a website then it’s important to have a database. 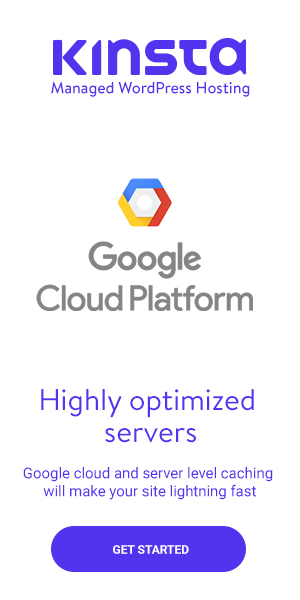 And if you want to transfer your website from one host to another then at that time you have to transfer the database too for which you have to create a new database at your new web host. You may think that its kind of hard to create a MySQL database but let me tell you that it’s very easy to do. Using cPanel is somehow a big thing for tech savvy people. There is nothing you can’t do. And when it comes to create a WordPress database then you just have to follow some steps which I am going to show you in this post. 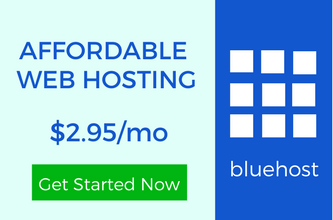 Step 1:- First thing is you have to login into your cPanel of your web host. 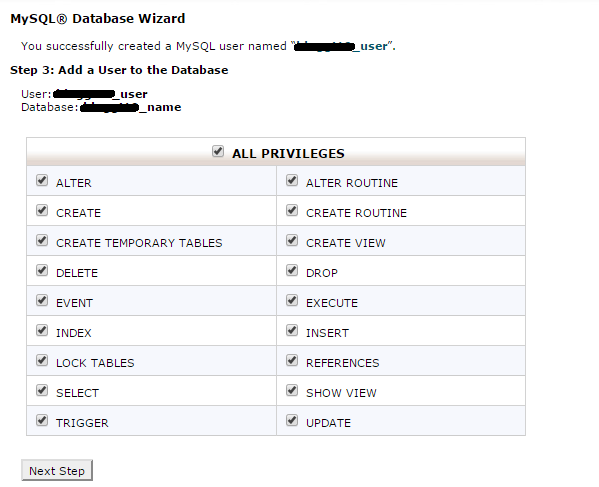 Step 2:- After that search for databases section in which “MySQL Database Wizard” is present. This is the first technical approach when we talk about creating a MySQL database. 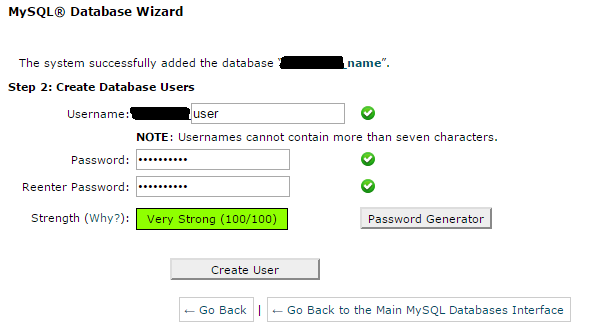 You have to click at “MySQL Database Wizard” and a new page appears to you. Step 3:- Now you can see that a box is there in which you can fill the name of your database you want to create. For creating a database name. Fill the name and click at “Next Step”. Step 4:- Again a new page appears to you where you have to create a new user for your database. You have to fill the name of the user you want to create and after that, there are two other boxes to fill for the password. You can generate a new password with the option shown there or you can add any password of your own. It is always recommended to use a very strong password for safety purpose. After filling all the information you have to click on “create user” option and your new user is ready. Step 5:- Now it is the last step to follow and after that, you will not ask how to create a database? There are many options to choose in front of you on this last page. This step is for adding a user to the database. You have to select “All Privileges” and all the options will be selected. The final thing you need to do is to click on “next step” option and at the next page a message will be shown to you for congratulating you for creating your MySQL database. Having a database is the necessary thing for running a website. You can’t run a website without it’s database. You should know how to create a database using cPanel? 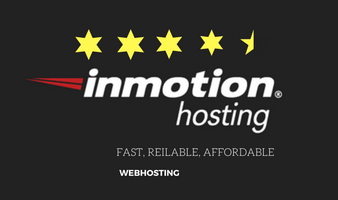 Importing your old database to your new web host needs to have a new database at that web host for which you have to create a new database. What do you think about the method described above? Is it easy or hard to follow? Personally, I think when you want to do any work then going step by step is the key point for the completion with accuracy. If you still face any problem then I am here to help you. How To Add An Audio Music Player In WordPress Sidebar? Indeed a quality article from you. It is well researched and nice presented.Thanks for sharing such an amazing tutorial regarding creating a database for website using Cpanel. I am glad that you have found this article informative. I have noticed many newbies talk about database so its important for them to know about creating a new database for their WordPress website. Your tutorial is straight and simple! I mean, I have never been comfortable handling stuff that has to do with MySQL though I do play around my cPanel most times especially editing my functions.php and all that. Your article looks promising and I will for sure come back to it to learn how to create a database of my WP site. I use a plugin for this or will say that I have a plugin that automatically create and backup my DB on set times. In all, thanks for sharing this one, it’s awesome! There are many bloggers who don’t feel good working with control panel. But there is nothing difficult. Using cPanel is fun. I like to do new things with it. If you want to do any change in your website then its important that you should know about technical things. Using a plugin for backup your database is good. But I prefer to do it directly. Bloggers should know how to create a new database? When it comes to playing around with my C panel, I do give it to others to do. However it is important for me to have an understanding in order to communicate what exactly I need to do. This is the most comprehensive article I’ve read! You made it so user friendly and I thank you for that. Using cPanel is a kind of techy stuff and most of people don’t enjoy it. For pursuing to any change for your website you should know the proper step by step process only then you can do it write. I have met many bloggers who broke their websites by doing some mistakes while using control panel. But If you go through the process defined in the above post then there will nothing be wrong. It was only the other day I visited my host and got into C-panel. I was a little edgy and very careful. But it appears from your instructions that it is a simple process. I always get nervous around this techy stuff because if I do it wrong – well generally there are no fix it instructions or if there are they are well above my head. Great post and encouraging for people like me. Thanks. You are not the only one who get scared of using cPanel. There are many bloggers who don’t do techy stuffs at all. But trust me its very easy and interesting to play with control panel. If you fear that something will go wrong then the best thing is to have the backup of your website and database so that if you break your website then you can build it again. Another great and helpful technical post mate! I am not that much techincal person for cpanel and all. The way you have explain each and every point with the screenshot it will help to understand the porcess of it. It will help to newbie bloggers and developers too who is just started their carrier in blogging or developing. Thanks for sharing technical post!! I always say that technical stuffs are interesting. If you try to go through it then its very easy to create a new database. Using control panel isn’t that much hard as people think. Like you have noticed many bloggers who don’t do experiments with their website just because they are afraid of using cPanel. It is always recommended that you should learn everything for better future in your work place. You have come up with a precise and useful article. A Database plays a vital role in saving our content. The content you have shared here is useful for both the techie and non techie to create database for their website using cpanel. Anyway thanks for sharing. I am glad to hear that you have found it useful. For sure database plays an important role for a website and you should know how to create it? Its always good to have it’s backup so that you can store it again. This is a very wonderful tutorial. Database is an integral part of any website and no site can perform without it. Some people might assume that they don’t have to learn how to create it but you might find yourself in a situation where you will have to create one someday especially if you want to install wordpress manually or if you want to create an addon domain on your host. Thats why this tutorial is very useful and I’m going to share it immediately. You are right. Bloggers should know how to create a database. When you try to add a new domain at your web host then you should know about creation of database. When you transfer your website from one host to another then you should create to a new database where you will upload your old one. Let me be sincere with you, when it comes to playing around with my cpanel, I’m always gripped with fear as I fear messing up at the end. But this tutorial of yours has made things really easier and I think I can do it now. Thanks and please do have a great weekend. People fear from techie things. They should try new things. There is always a possibility that if you try something to work then for sure you will get success. When it comes to use cPanel then its kind of amazing stuff to do. I am glad that I could help you. Good to see you and as usual, I have missed your tutorials which are so easy to grasp. This will help a lot of newbies. Thanks for sharing. I am glad that even after a long gap you remember my blog posts. For sure I will try my best to write some amazing blog posts. I always try to concentrate on describing things in an easy way which is easy to understand. Thanks for the great post. I dont know much about cpanel and its uses. Now i am aware of that. I will also try to use this trick of database with cpanel. Keep posting. I am glad that I could help you with database creation. You can learn more about control panel when you go through it. Its very easy to learn and you can build a great stand at these technical stuffs. Have a rocking week ahead.